An often overlooked SEO factor for podcasters is that images in posts contribute to SEO rankings. Of course the images should be interesting and relevant in the first place, but technically the way images contribute to your SEO ranking has to do with “ALT” tags, as well as with their role in determining your site loading speed. The official definition of ALT text (alternative text) is a word or phrase that can be inserted as an attribute in an HTML (Hypertext Markup Language) document to tell Web site viewers the nature or contents of an image. 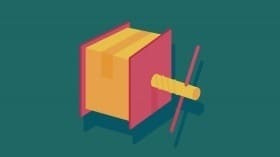 The ALT text appears in a blank box that would normally contain the image. This is useful when an image link is not available because of a broken or changed URL or some other issue. Also, ALT tags serve as accessibility properties that provide the visually disabled, (who use screen reader software to read page content out loud), with information about each image. This has the additional side effect that search engines pick up these ALT tags as well and index your article based on the image ALT tag language used. So for SEO Image Optimization, if you can use your main article key-phrase in the ALT tag, it will add to your overall SEO post optimization and keyword density in a positive way. Keep in mind that if you’ve already used an image and created an ALT Text tag for a previous posts, changing that image’s ALT text tag might negatively affect the SEO ranking of previous posts. 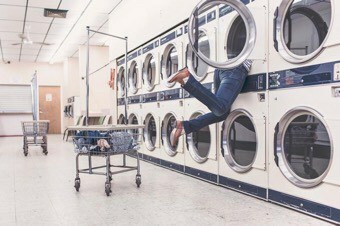 A typical example of this are featured images in posts. If you have already used an image on a post once before, it is likely to already have an ALT tag assigned optimized for a previous SEO keyword. Therefore if you would like to use it again it is better to upload a new version of the image, even if it already exists in your media library. Site load speed has been a search rank factor for a long time, and the speed that your page loads is directly influenced by the size of the images present on your pages. WordPress and most themes process images into several sizes when you first upload them, so that thumbnails and several small to large size variations can be used. 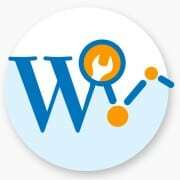 But WordPress compression algorithms are often not ideal. We have tried to list some great SEO tools throughout this series, and image processing tools are often overlooked. We’ll get to these in a minute, but first of all it helps to you know if images on your site contribute to slow loading speeds, and by how much. Here are 2 tools that help you measure the loading speed of your site, and allow you to compare before and after optimization. Yslow: Yahoo!’s Exceptional Performance team has identified 34 rules that affect web page performance. 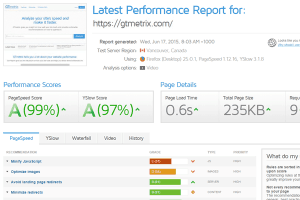 YSlow’ s web page analysis tests your site against 34 rules that affect web page performance, and is based on the 23 of these 34 rules that are testable. Once you decide you’d like to optimize your site images in order to improve load times, here are some tools that help you do it. If you have an existing site with lots of images, a utility to help optimize these is great, but in general terms I would also recommend to pre-process and size images for use on your web site when you first upload these or create them in Photoshop or your favorite graphics program. Uploading 12,000px wide images straight from your camera is lazy, and there is no use for these on your site without first optimizing them, and utilities like Snap-Converter mentioned below make this process very easy. So in general terms I recommend optimizing images before they ever make it to your site. WP Smush Pro is a premium image optimization tool that uses advanced algorithms to compress your images while maintaining their quality and dramatically improving your website’s page speed. It will go through your entire media library and replace your on-line images with optimized versions, while maintaining quality. 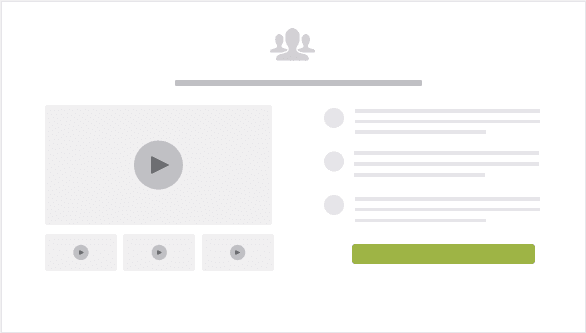 This can significantly speed up your site. 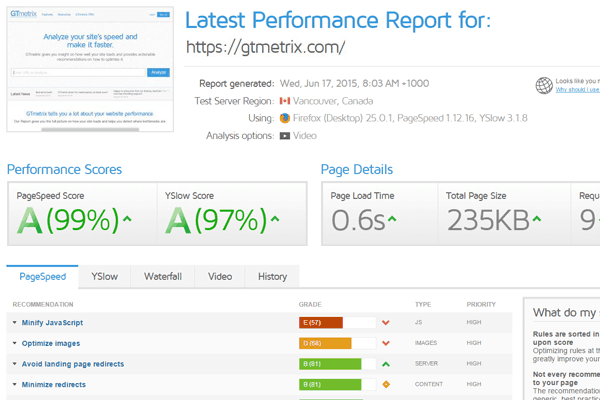 Run GTmetrix before and after, and you will be rewarded with a vastly improved site load speed, and Google rank. It also processes every new image you upload, so you can be assured that all of your site images are compressed optimally. 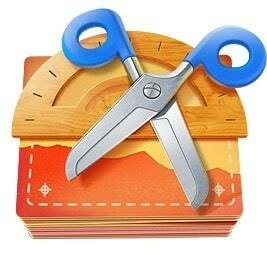 Convert images as well as Mac and Windows icon files. Supports standard bitmap types as well as digital Camera RAW types, Photoshop documents, and more. View the complete list of supported file types. Resize Sense is a utility that helps crop and resize images to a variety of optimized sizes. Very useful for when you need to convert a range of differently sized images into the same size and aspect ratio. Helps to eliminate the hours of tedious work needed to resize, crop, straighten, rotate, flip, edit metadata, and rename many images one at a time. 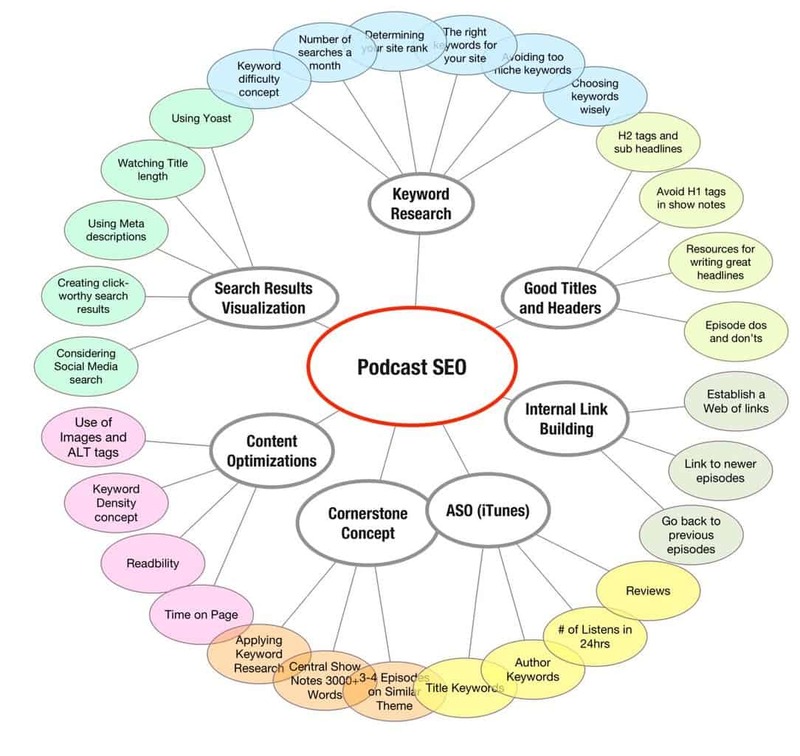 In this post I’m covering some SEO tips and research strategies that have emerged from discussions we’ve had with many of our blogging, content marketing and podcast production clients. 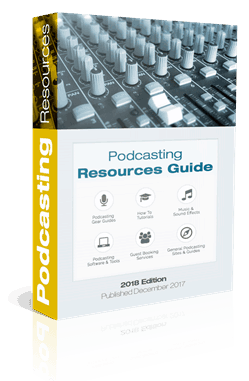 The good news, unlike in years past, is that almost all of our clients consider SEO a “must have” component of running a podcast or blog. 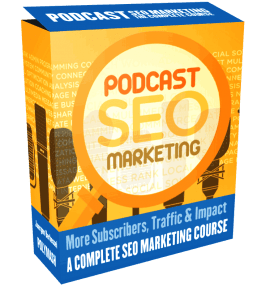 And for many, their blog or podcast serves as the central inbound marketing component for their site, driving traffic and increasing their e-mail lists. I just need to find a popular keyword that lots of people are looking for, and then optimize my post for it. It might seem quite easy to imagine a popular keyword that you want to be found for. 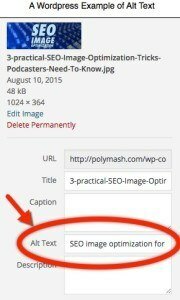 Why not try and optimize a podcast episode for the keyword “podcast” for example? A popular term, 350K searches a month. Would that not drive lots of traffic to your site? The answer is yes, but only if your site can rank in the top 50 search results for this keyword. 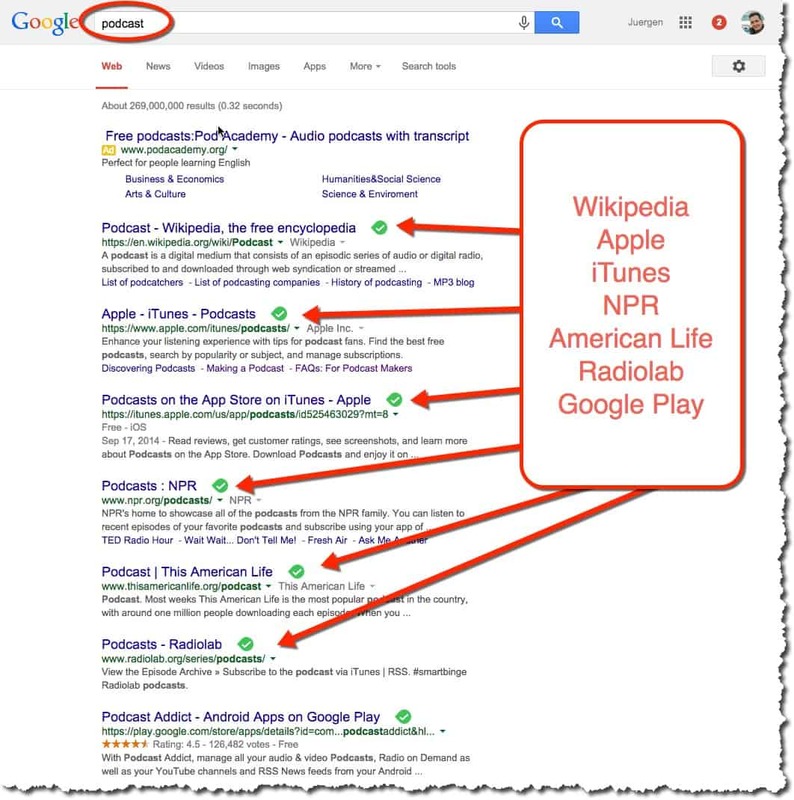 Suggestion: Click here to do a search for the word “podcast” on google right now, and look at the top 10 results. Who are the sites ranking in the top 10? That’s right, Wikipedia, Apple, NPR, The Atlantic, etc. In other words hugely popular sites. Now ask yourself, on which page of the search results do you think your own post would show up? That’s right, page 200+ or something like this, unless you have a massively popular site. 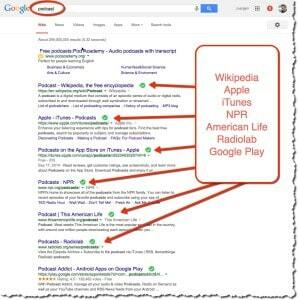 And when was the last time you looked at or clicked on anything beyond page 2 of a google search result? Do not try to rank for hugely popular keywords. You will not be in the top 50 search results, and therefore your post will not generate any organic search traffic to your site. 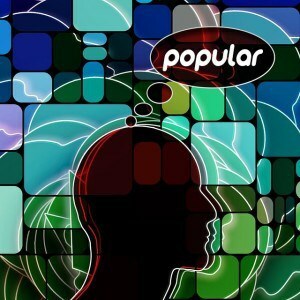 You need to research keywords and keyphrases in order to know if they are in fact “too popular” for your post to rank for them. No worries though, we will cover all of these considerations in this blog series. 2.) Is there such a thing as being “too niche”? OK, so in our previous example, the keyword “podcast” seems very generic, and we’ve realized it’s unlikely we can rank our post for it. So what about the other extreme? Maybe it will be easier to rank for a key-phrase that is very specific? Assume for a minute we optimize a post for the term “health tips for dads”. And a few days or weeks after we published the post, HOORAY, we are ranking on the top 1-2 pages for this post! How many people a month do you think are looking for this term? Oh, sorry, a quick peek at Google Adwords reveals that this term is searched for 0 times a month, which is exactly how much traffic this keyword choice will generate. You may rank in the top 10 search engine results, but that does not mean you will get traffic from a keyphrase that is too niche. 3.) So what’s the answer then? 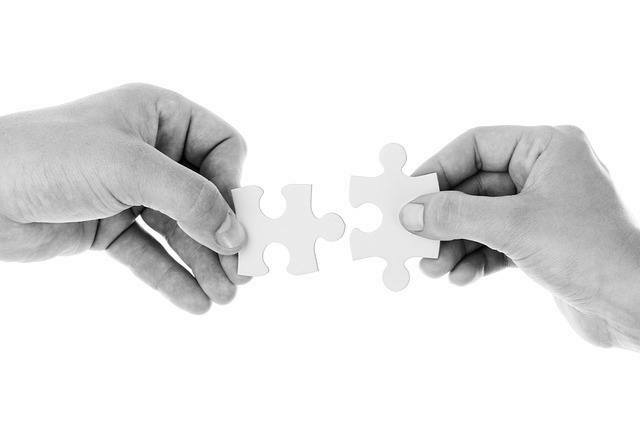 The answer is finding a fit: To identify keywords and key-phrases commensurate with the search engine power of your site overall. The rule of thumb we follow is that if you have a brand new site with little traffic (Under 2000 sessions a month), try and find key-phrases that have at least 70 searches a month, but stay under 300 searches a month. 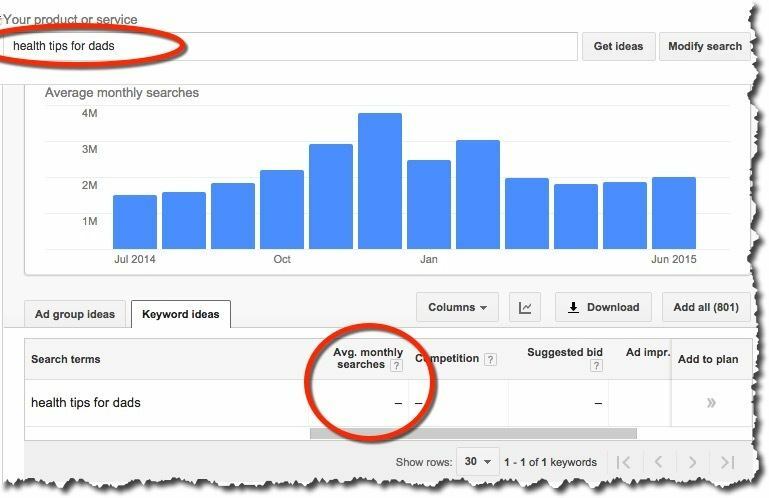 If you have a popular site at least 1-2 years old with 5000+ month visitor sessions, perhaps you can rank for key-phrases with 300+ searches a month. But to rank for content that has 1000+ searches a month, you need your site to have both a lot more traffic. Ask yourself, is it better to be on page 100 for a keyword that is popular, or on page 1 or 2 for a keyword that is un-popular, but that people are still looking for 100 times a month? Have a look at Alexa rankings, there you can look up your site’s rank for free. Keep in mind, these are my personal educated guesses based on our experience, I would love to hear from you if you manage to “break the ceiling” of these rather cautionary numbers. Alexa is a great toolset, and if you sign up for the free version you can create charts and comparison graphs to track your site’s rank vs your competitors. New sites are typically ranked 5million or higher. If you are, stay with key-phrases that are searched for at most 70-100 times a month. If your site is ranked above 1.5Million on Alexa, you can likely rank for key-phrases that have 300 monthly searches and above. If your site is ranked above 500K on Alexa, you can likely rank for more popular search terms and key-phrases that have 1000 monthly searches or more. 5.) How can you tell the number of searches a month for any given key-phrase? 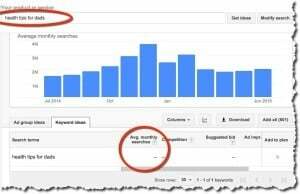 Notice that earlier we mentioned checking up on how many times a month people search for a specific key-phrase. This is super valuable information, but how do you do this? The answer is Google AdWords. 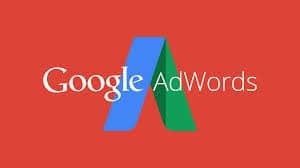 If you have not ever placed any pay-per-click ads with Google before, you may be unfamiliar with the platform, but it is free to use and has the best keyword research tools available for free. The sign-up process is a pain, as it requires a credit card and the only way you can sign up is to launch your own initial PPC ad, but you can simply pause the ad as soon as you launch it, and it won’t cost you a cent. The process may be scary, but it is definelty worth it. 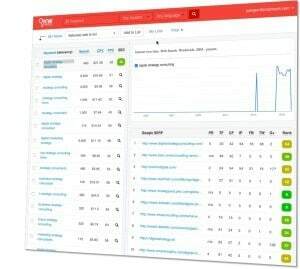 Keyword difficulty is a data concept and score that shows you exactly how hard it is going to be to rank in the top 10 search results on Google or other search engines. It does so by investigating the sites that show up in the top 10 results of google, and then comparing their SEO maturity and rank to your own. So a low keyword difficulty score is better, it means that you are more likely to be able to compete with the sites in the top 10 search results. A high score means that the top 10 search results are occupied by popular sites that you will have difficulty competing with. Keyword difficulty tools we use provide a range of information about your competitor sites that currently occupy the top 10 search results. Domain age, # of incoming links, Alexa ranking and social signals are all able to pinpoint “weak competitors” currently showing up in the top 10 search results. 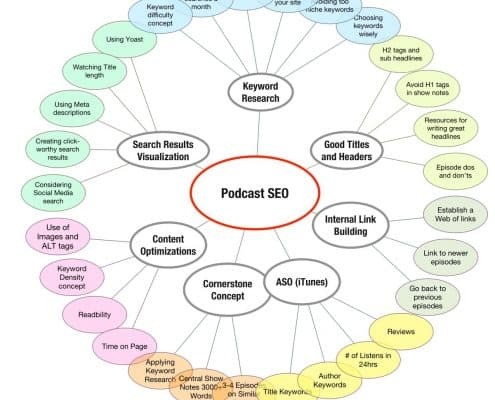 Using these tools as part of our SEO services, and selecting “the right” keywords using the keyword strategies outlined above, we can often quickly accurately create a recipe that places a post or podcast episode into the top 10 search results on Google and other search engines. Are there any “All In One Solutions” ? When we’ve been talking about keyword optimization, it’s been largely about being found on the web. What about being found on the app store? This is generally called ASO or app store optimization. Within iTunes, there are only limited places where you can ensure that people can find your show. The title of the podcast is the most important one, but keywords are difficult to embed there unless the title of your show lends itself to this. 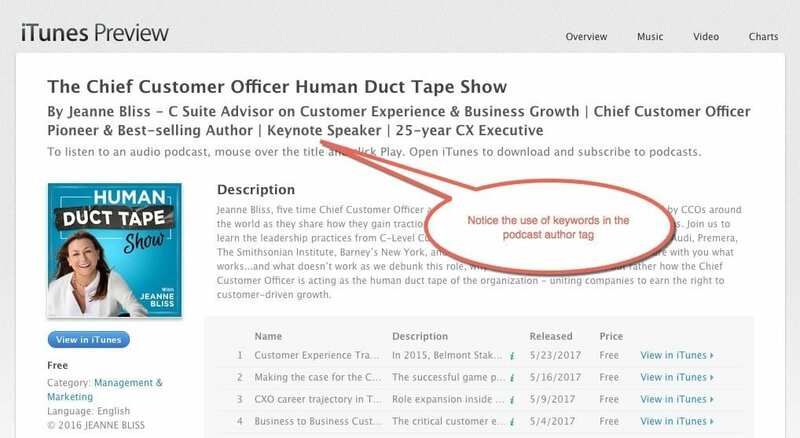 Keywords within the description of the podcast are not indexed, and therefore people cannot easily find you with these on iTunes. 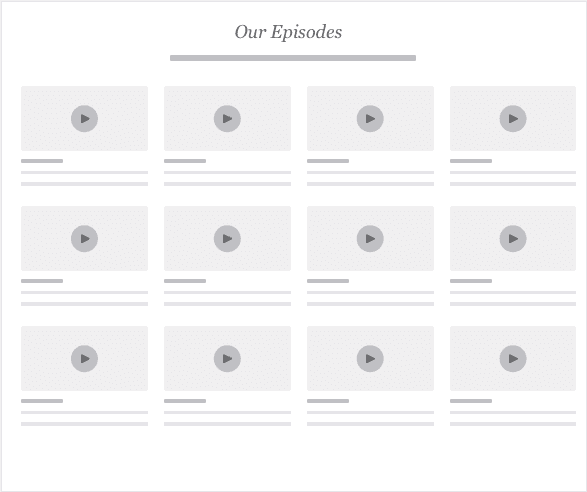 However, and often overlooked place to embed keywords relevant to your show is the Author Title Tag. Tip: Use the author title tag to embed keywords for your title. 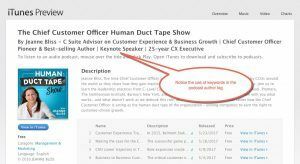 Here is an example of a podcast we produce called “The Chief Customer Officer Human Duct Tape Show”. Notice how the name of the podcast host includes keywords that are significant for her business. Spending just a little time on learning the above keyword research tips can have a major impact on your site traffic. It may seem overwhelming at first, but studying this for an hour or two a week is all it takes. What are some keyword research approaches that are working well for you? We would love to hear from you about what is and what isn’t working for you.